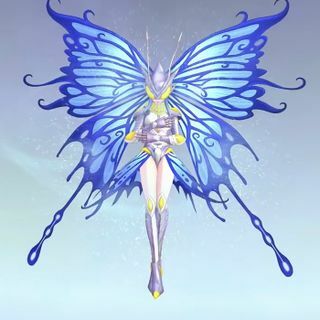 Difference between revisions of "Hudiemon"
A humanoid Insect Digimon with the wings of a butterfly. Although it is initially cautious of strangers, it will reveal its cheerful, innocent personality to those it has grown close to. It loves singing and dancing gracefully in the sunlight, and the sound of its singing has even been dubbed an "Eternal Treasure"[N 1] by some. Its Special Move is soaring into the air and dishing out a kick from above (Flying Kick), and flapping its wings to stir up a gust that spreads its scales (Infinity Dream). While it is capable of inflicting poison or paralysis on the enemy using its Infinity Dream, its main function is actually to ease the pain and suffering of its wounded allies. Húdié 「蝴蝶」 is Mandarin for butterfly. Hudiemon's name and design are a direct reference to the Zhuangzi's Dream of the Butterfly. Evolve from Wormmon with level 15+, sp 40,spd 40, cam 100% and after completing the game. ↑ Eternal Treasure (永遠の宝物) is the name of an indie single album by Wada Koji, released in September 2006. ↑ Infinity Dream is a reference to the sentence 無限大な夢 ("Endless Dream") in the song Butter-Fly by Wada Koji.